Botrytis cinerea or commonly referred to as "Noble Rot" by oenophiles, is the magical necrotrophic fungus that affects many plant species, although its most notable hosts may be wine grapes. It's responsible for the worlds most famous dessert wines such as French Sauternes, Hungarian Tokaj, and various Late harvest German Rieslings. In viticulture Botrytis cinerea can be an amazing blessing upon those who seek to create sweet dessert wines, or a complete disaster for the everyday vigneron. The fungus gives rise to two different kinds of infections on grapes. The first, "grey rot", is the result of consistently wet or humid conditions, and typically results in the loss of the affected bunches. The second, "noble rot", occurs when drier conditions follow wetter, and can result in distinctive sweet dessert wines. 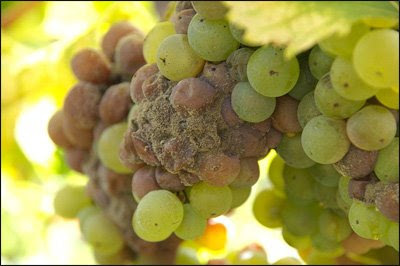 In the positive Botrytis infection known as "noble rot", the fungus removes water from the grapes, leaving behind a higher percent of solids, such as sugars, fruit acids and minerals. This results in a more intense, concentrated, and amazingly complex wine! Botrytis bunch rot can be a negative condition of grapes caused by Botrytis cinerea that causes great losses for the wine industry. It is always present on the fruitset, however, it requires a wound to start a bunch rot infection. Wounds can come from insects, wind, accidental damage, etc. To control bortrytis bunch rot there are a number of fungicides available on the market. Botrytis is often spooted in Moravia region, Czech Republic, where it produces great quality wines marked as "vyber s bobuli". I have drunk some sweet Palava and Chardonnay from Mikulov area and they were astounding in their aroma.